Family of Charles Clinton LINDLEY Jr.
1. 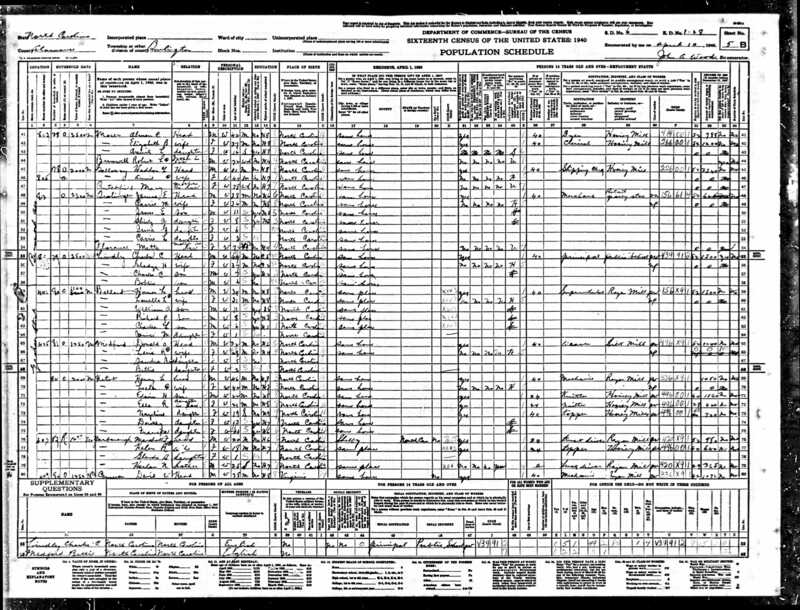 Appearance in Document: NC Birth Index, 1932, Alamance County, North Carolina, United States. 4149 1932, Lindley, Boy, child of C. C. Lindley, recorded in Vol 20 page 370. 4. Lindley, Bobbie, son, age 6, not attending school, born NC. 3. Story: Burlington, Alamance County, North Carolina, United States. When Bob and Clint were growing up in Burlington near the hospital, they used to go to the incenerators at the hospital and take the discarded flowers. Clint would remove the old outside petals from the roses, add violets from a nearby field, and make corsages that he would sell to the nurses. When he was 14 or 15, he won a blue ribbon at the State Fair for flower arrangement. 4. Story, 21 Nov 1946, Bonlee, Chatham County, North Carolina, United States. Les has a copy of a paper Clint wrote on 21 Nov 1946, while in Bonlee High School where his father Charles was principal. The paper is entitled "North Carolina's Number One Need -- Good Health." 5. Story, 1950, Bonlee, Chatham County, North Carolina, United States. In the 1950 Bonlee High School yearboook "Treasured Leaves", Clinton Lindley is the Senior Class Vice-President, and he is voted "Best All-Around". His entry shows him as Declamation Winner as freshman, sophomore, and junior, County Health Essay Winner as freshman, Basketball as freshman and junior, Cheerleader as freshman, junior, and senior, Marshal as junior, 4-H Club officer as sophomore, yearbook editor as senior, school newspaper staff as senior (the photo shows him as Social Rep. and Advertising Mgr), office worker as senior, and in the play as junior and senior. He also appears in the Basketball Team photo and the Commercial Class. There are 15 people in the senior class. 6. Education, 1950, Bonlee, Chatham County, North Carolina, United States. Clint graduated from Bonlee High School in 1950. 7. Occupation. Clint was a member of the cast of "Horn in the West", an outdoor drama set in Boone, NC. Maybe also in "Unto These Hills" at Cherokee. Was a part-time ranger on Mt Mitchell. 8. Education: University Of North Carolina, Chapel Hill, Orange County, North Carolina, United States. Got degree in Botony from University of North Carolina. While there did apprenticeship at University Florist. Was also in several Carolina Players productions. 9. Story, 1956, Pensacola, Escambia County, Florida, United States. Joined Marines after college graduation. Went to pilot school at Pensacola, hated it, did not graduate (did not like flying by instruments), so he was sent to Quantico for basic training. He was at Pensacola in 1956. 10. Story, 24 Mar 1956, Mt. Vernon Springs Presbyterian Church, Chatham County, North Carolina, United States. Clint decorated the church for Bob and Shirley's wedding, and did corsages using orchids. 11. Occupation: Floral Designer, Sep 1957, Bronxville, Westchester County, New York, United States. Clint was a flower designer at the Nosegay Flower Shop in Bronxville, NY, at least as early as Sep 1957. Nosegay was one of several shops owned by Charles Bergen. Clint won many awards while there, including an orchid display at the International Flower Show in NY Coliseum in Mar 1959, silver trophy for a Rose exhibit featuring 15000 roses at the same show in Mar 1960, an International Trophy at the same show for an exhibit featuring flowers from 12 countries. Also in Mar 1960 he created a special exhibit at Rockefeller Center on orchid uses for the home, which was done in a specially erected greenhouse. In 1968 he did a display in the Pan Am building. At one time he went to Hong Kong to design a line of artificial flowers. His customers for home floral arrangements included Jack Parr and other residents of Bronxville, a wealthy suburb of New York City. On 16 Oct 1964 Clint became Vice-President of Nosegay, Inc. On 10 Apr 1965 Nosegay opened a shop in the Carlyle Hotel on Madison Ave at 76th street. Clint did designs there, which included special arrangements for the rooms of visitors at the hotel including Lady Bird Johnson and Mrs Hubert Humphrey (article in NY Times, unknown date, pL21). Clint participated in many flower conventions as a guest designer in convention design schools. 12. Story, Cir 1960. Clint was featured in several magazine articles and authored several more. In Jan 1960 Professional Florist wrote an article about "cash and carry" flowers, a new approach to selling flowers at the time. Clint was featured in a large article in Feb 1960 issue of Professional Florist magazine. (magazine in possession of Gladys Haywood Lindley). Wrote article in July 1960 Professional Florist on casket design and flowers. Wrote article in Aug 1961 Professional Florist on planning an exhibit. 13. Story. Clint worked with an off-Broadway theatre company for a while. 14. Property: Split of Woodlin, 11 Dec 1965, Chatham County, North Carolina, United States. Deed from Charles C. Lindley Sr et al to Charles Clinton Lindley Jr, Book 312, page 54. 16. Story, Sep 1968, New York City, New York, United States. In Sept 1968, Clint received the Society of American Florist's Sylvia Award for outstanding display of flowers and plants at the 84th Annual Convention. He was working at the Nosegay florist shop in New York City at the time. (announcement in possession of Gladys Lindley) Gladys says receiving this high honor helped push Clint to leave the flower business, since he had achieved the top of his industry. Also, Charles Bergen, the owner of Nosegay, went bankrupt about this time. 18. Residence: 500 Piermont Avenue, 1995 To 1998, Piermont, Rockland County, New York, United States. 4476 This may be the address of Tummee Thyme or The Bird Cage, not a residence. 19. Occupation: Store Owner: Nyack, Rockland County, New York, United States. After Clint left the florist business, he set up a country store in Nyack, NY, called Tummee-Thyme. He had another store called the Bird Cage. 20. Story, 1993 To 2001, Hillsborough, Orange County, North Carolina, United States. He later moved back to NC and moved into a house next door to Woodlin. He had several antique stores in Hillsboro and Winston-Salem, NC. He purchased an 18th Century historic house in Hillsboro which he renovated with the help of his brother Robert and friends. He spent most weekends travelling around the eastern US attending antique shows. Clint was particularly interested in "primative" objects. 21. Story, 1994 To 2001, Charleston, Charleston County, South Carolina, United States. He sold his shop and house in Hillsboro, and in 1995 he started a store in Charleston, SC, called "Lin Archer" specializing in folk art, and began building a bed and breakfast there. The store is named after Clint and his partner, Erich Starcher. 22. Residence: 3887 Fork, 1998 To 1999, Mars Hill, Madison County, North Carolina, United States. In 1998 Clint and Erich purchased a house near Mars Hill in the North Carolina mountains and moved there. Clint still also owned the house next to Woodlin. 23. Residence: 524 N Griffing Blvd, 2001 To 2002, Asheville, Buncombe County, North Carolina, United States. 24. Residence, 2001, Yanceyville, Caswell County, North Carolina, United States. Clint and Erich moved to Yanceyville, purchasing the Bartlett Yancey house. 25. Obituary, 23 Jun 2002. YANCEYVILLE -- Charles Clinton Lindley, Jr., a well known art and antiques dealer specializing in American art, died unexpectedly, Wednesday, June 12, 2002, at his home, the historic Bartlett Yancey House, in Yanceyville, North Carolina. Lindley was the son of Charles Clinton Lindley, Sr., deceased, and Mrs. Virginia Gladys Haywood Lindley of Cary. He was 70. Lindley, a native of Alamance County, was educated in local schools and graduated from the University of North Carolina at Chapel Hill. Lindley is survived by his mother, a brother and sister-in-law, Mr. and Mrs. Robert Lindley of Chapel Hill, an extended family of nieces, nephews, and cousins, and his long-time partner, Erich Starcher, of the home. A gifted horticulturist and floral arranger, Lindley was a member of the American Floral Society and the winner of numerous awards, including the Pacific Rim Design award and the American Home Journal award for Outstanding Floral Design.